That astute observer of human affairs, SpongeBob SquarePants, once proclaimed, “I smell the smelly smell of something that smells smelly”. Were SpongeBob a resident of Australia, rather than a citizen of the underwater city of Bikini Bottom, his olfactory nerves would be assaulted by an aroma far more piquant. SpongeBob and his pet snail Gary might even embrace the cause of National Party firebrand, Senator John Williams, and the swelling chorus of voices crying for a royal commission into white collar corruption in Australia. 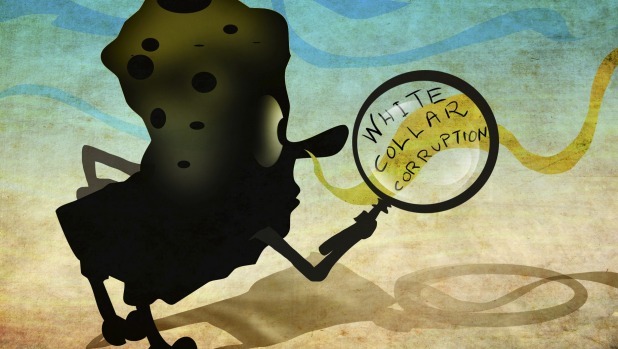 If there were any faint doubt that blue collar corruption, which led to the trade union royal commission, is entirely eclipsed by skulduggery of the white collar variety, it is rapidly dispelled by a thumbing-through recent reports of the Senate Economics References Committee. The headlines deliver a narrative in themselves. Once, Senate reports were adorned with anodyne titles like: “The regulation, registration and remuneration of insolvency practitioners in Australia: the case for a new framework“. That was from September 2010 (but it would have been better titled ZombieLand: Packs of Marauding Liquidators Ransack the Dead and Dying). Happily, the Senate scribes have become far more descriptive since then. A heart-rendering “I just want to be paid“, was the title for the inquiry into insolvency in the Australian construction industry in December last year. By February this year, and in the wake of the suite of financial planning disasters, the tempo had risen to embrace the language of weaponry: “Scrutiny of Financial Advice Part I – Land banking: a ticking time bomb“. Shortly after that, in early March, came: “Agribusiness managed investment schemes: Bitter Harvest“. The committee described “horrifying deficiencies in the way some advisers adhered to the basic requirements to know their client, the product they were recommending and to have a reasonable basis for their advice”. The bitter harvest of horrifying deficiencies was trumped two weeks ago by the Senate’s 7-Eleven findings. The report, “A National Disgrace: The Exploitation of Temporary Work Visa Holders“, chronicled the “severe exploitation of highly vulnerable (migrant) workers”. Only a national tragedy outranks a national disgrace. Clearly the Senate editor and assorted committee members are fed up. The officious, weasel-words are gone, and justifiably so. Barely is there a sector untouched by scandal: financial advisers, banks rigging money markets (BBSW saga), liquidators, life insurers, tax-dodging multinationals, rapacious gold-plating energy companies, foreign bribery. In some cases, such as the Commonwealth Bank, the perpetrators were promoted. In others, such as the mortgage fund operators of the Gold Coast, the promoters and or their families are back in business. Given the sheer breadth of white collar chipmonkery, the most pressing question when pondering a royal commission must be, where do we start? What would be the terms of reference? Would it be the Royal Commission into Australia? Those who argue against it contend, rightly, that the cost to taxpayers of a royal commission is high, that government agencies are already there to police things and that “the market” will eventually drive correct outcomes. It is true that markets have bobbed up to partially fill the breach of regulatory inertia, namely class action lawyers and their funders. These are of greater fear to company directors than regulators. Still, something has to be done. The sheer inequity of redress for cuff-linked crooks visa-vis blue collar crims is tearing at the social fabric. How’s this for a double standard? Malvern man Andrew Scott pleaded innocent but was found to have broken the law after presiding over the loss of $5 billion in Centro Properties’ share value, or other people’s money. Scott has been fined $30,000 – in a court case that cost taxpayers and shareholders more than $3 million. Warrnambool man Tyrone Lynch pleaded guilty to causing $5900 damage after he ran out of grog at his mum’s house, broke into the local Terang Mortlake Football Netball Club and took 30 cans of grog, then went back to his mum’s and kept drinking. Lynch was sentenced earlier this year to 18 months in jail. While the cost of a royal commission may be high, the eventual cost of the encroaching ”moral hazard” will be higher, both in human and economic terms, particularly if institutions and their executives continue to be mollycoddled and act with impunity for long enough. We are at that point now; an unprecedented economic boom, no recession for 25 years, a billowing hole in the national budget, extreme leverage in the financial system, falling terms of trade and a retinue of financial scandals for which nobody ever takes the fall. Senate inquiries have been effective in highlighting the problems but rarely do they give rise to reform. The shocking behaviour of liquidators for instance was well exposed by the Senate, but little came of it. A royal commission may be pageantry, which can be a good thing in itself, but it also has powers that are not available to parliamentary inquiries. And importantly – at a time of heightened suspicion over the influence of party donors and lobbyists in the political system – it would deliver the credibility and efficacy of independent judicial oversight.